Yakubu Abubakari was a Ghanaian footballer who played mainly as a defensive midfielder. He was born on 13 December 1981 in a southern Ghanaian city, Tema, where he coincidentally gave up the ghost. The popular footballer played for the Black Stars and later moved up to the international scene where he played for Great Mariners, Ajax and Vitesse. While playing for the Black Stars, he made 16 appearances and was part of their squad in the 2006 Africa Cup of Nations. He also won 16 caps for his country for being among the side led by Ratomir Dujković at the game. Yakubu also contributed in making his country take part in the world cup for the first time as he was among the people who played in the 2006 FIFA World Cup qualifying stage. Regrettably, though, his name was excluded from the final squad. The agile player represented Ghana at every age group from under-17, Under-20 to the Under-23 level. He was a versatile player and as such, could also play in defense. At the age of 17, he joined the former European champions Ajax Amsterdam. Yakubu spent 10 years in Netherland playing for the club. The prominent soccer champ made his debut in Eredivisie league on 19 April 2000 where he played 50 minutes in a 1-1 away draw against FC Den Bosch. Yakubu finished his first season with only five appearances. In the following four years, Yakubu featured in an average of 15 league games, making 89 appearances and helping the Amsterdam team get to two national championships and also the 2002 edition of the Dutch Cup. He played in five matches in the UEFA Champions League, during the 2002–03 campaign but the game ended for him in a quarter-final run in favour of A.C. Milan, the eventual champions. During his time in Amsterdam Yakubu Abubakari won two Eredivisie titles in 2002 and 2004, and also played in the Champions League with the Dutch club. The Ghanaian international star made a total of 89 appearances for Ajax. Between 2004-2005, he was on loan to fellow league team Vitesse Arnhem. Afterwards, Yakubu Abubakari signed a permanent deal with Vitesse Arnhem for four years, being used at irregular intervals during four seasons and released in the summer of 2009. He had a trial with TSV 1860 München from Germany in early October but it was not successful. The dead star played with Vitesse Arnhem for five years. 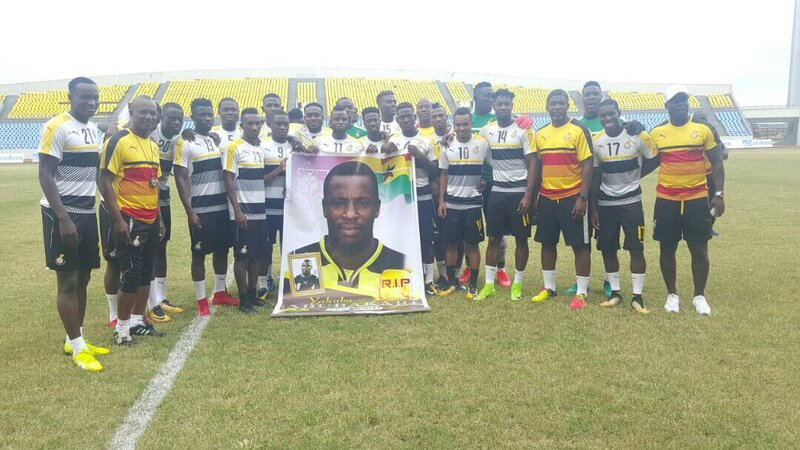 image source Black Stars players pay tribute to demised ex-player Yakubu Abubakari. On October 31, 2017, Ghana FA announced via a tweet, the death of the former Black Stars midfielder, Yakubu Abubakari reportedly died at the Tema General Hospital, Ghana, after an unrevealed sickness. The energetic player passed on at the age of 35, leaving Ghana soccer fans in shock over the sad loss. Multiple media reports claimed that the fallen national star died on the afternoon of the said date as doctors were unable to treat his condition. He was reportedly admitted earlier in the week and was placed on life support. During Ghana’s final 2018 FIFA World Cup qualifier against Egypt in Cape Coast on November 12, 2017, a minute’s silence was observed in memory of the late former Black Stars midfielder Yakubu Abubakari before the game kicked off. This was announced on the country’s FA’s official Twitter handle ahead of time. From the time he passed on until now, however, not much information has been given with regards to his health condition, prior to his death. The 36-year old has been described as a great person on and off the pitch. He will be missed for his personality and talent.